Countdown To Shutdown: 6 Days : It's All Politics Six days before the federal government is due to shut down, Sen. Ted Cruz's fellow GOP colleagues indicated they weren't prepared to follow his lead in the anti-Obamacare fight. 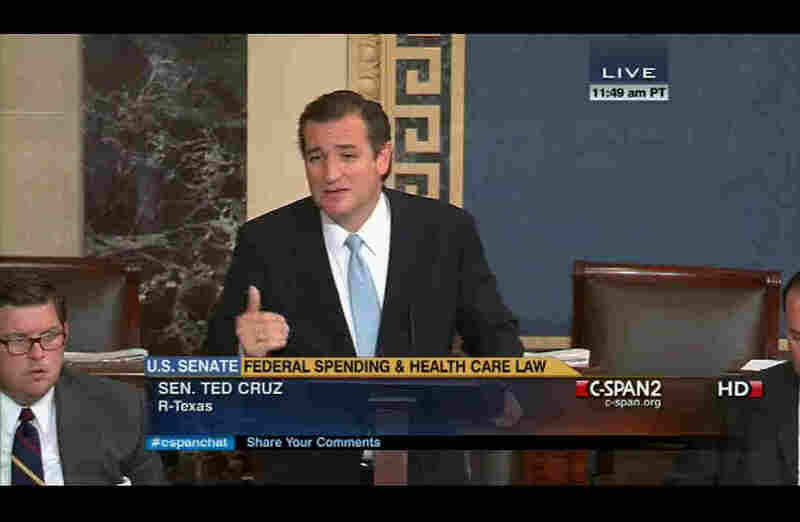 Sen. Ted Cruz's anti-Obamacare strategy seemed to fall flat Tuesday with many of his fellow Senate Republicans. With just six days to go before the federal government is due to run out of money, it's becoming increasingly clear that Republican Sen. Ted Cruz's fellow GOP colleagues aren't following his lead in the anti-Obamacare fight. That fact alone raises the odds of avoiding a government shutdown next week. It doesn't mean a shutdown won't happen, but it largely removes one of the major stumbling blocks — at least in the Senate. Led by Mitch McConnell, the Senate minority leader, a number of GOP senators indicated they would vote to let the Senate proceed to consider the House-passed spending bill that contains language to defund the Affordable Care Act. Senate Democrats were actually OK with that since they intended to vote against the House bill and strip out the provision to defund Obamacare and they have enough votes with Democrats alone to do all that. Most Republicans were OK with it, too: It allowed them to vote for the House bill with its anti-Obamacare provision. Cruz wanted Senate Republicans to filibuster the House bill — to stop it in its tracks — unless Senate Democrats agreed to weaken their ability to strip out the unfunding measure. "I intend to speak until I cannot stand," he said Tuesday on the Senate floor. But it was mostly for show. Sen. Harry Reid, the Senate majority leader, said Cruz's extended Senate floor speech wasn't really a filibuster because the vote to end debate and bring up the House bill would go on as scheduled. As McConnell told reporters Tuesday, Cruz wasn't attracting a lot of support from his fellow GOP senators because the Texas senator's complex strategy, among other things, made for murky messaging to voters. "We'd all be hard-pressed to explain why we were opposed to a bill we were in favor of," McConnell said. Allowing the Senate to proceed to a vote "on a bill that defunds 'Obamacare,' it doesn't raise taxes and respects the Budget Control Act — it strikes me as a no-brainer. "And so I'm not reluctant to explain voting for things that I'm for," McConnell said. "That's the way I see it. And I'm hopeful that a majority of the Republican conference will see it the same way." What McConnell didn't have to say is that Cruz's strategy would also increase the chances of the dreaded government shutdown. Also on Tuesday, Reid indicated one change Senate Democrats planned to make to the House bill — to have the period it covers end one month earlier, on Nov. 15, instead of Dec. 15. Reid told reporters there was some Republican support for that move since it would give the Senate more incentive to reach agreement on appropriations bills and not rely on another stopgap measure. McConnell said he supported that plan. Meanwhile, Reid hoped that Cruz's relative isolation in the Senate Republican Conference signaled that a critical mass of GOP senators might be more willing to work with Democrats than has been true recently. "One thing is very clear," Reid said. "There are a number of Senate Republicans who recognize the Tea Party agenda is wrong for the country and wrong for their party. So I hope that these reasonable Republicans will prevail upon their colleagues in the next few days, so that we do not have to shut down the government."